High Water Evolve Features Similar Taper With Our Classic High Water Line, But In Addition, Guideline Has Boosted The Buoyancy And Have Given The Line An Extra Optical Control Zone With A Highly Visible Orange Color To Help Identifying The Transition Between The Belly And The Running Line. It Is Built With A Smooth 13,5 -14,8 M/14 - 16 Yds. Long Head, Which Sets Controlled, Parallel Loops From Mid-Distance To The Full Line Length. The Drawn Out Back Taper Gives The Line Good Flexibility In The Handling Of Line Outside The Rod Tip. This Newcomer Features A Slightly Stiffer Coating And Core For Better Casting Properties And Durability. Extra Slick Coating Produces Longer Casts. High Water Evolve Performs Superb With All Kinds Of Casts And It Excels With Brilliant Balance And Accuracy For Exact Presentations In Mid- To Long-Range Situations. Looped Front And Laser Id Mark. In Class Wf6 & Wf7 The Total Lenght Of The Line Is 32 M/34 Yds. 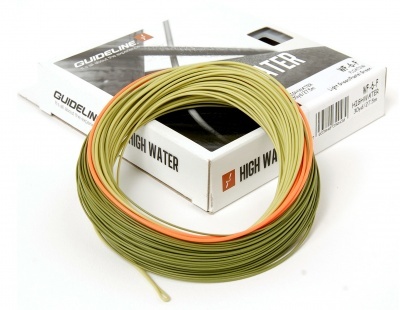 Perfect For Dry Flies/Nymphs/Streamers In Streams/Small Rivers And Lakes.